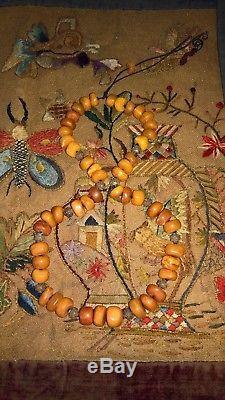 108 grams RARE Tibetan Antique Baltic Amber Necklace Butterscotch Egg Yolk. 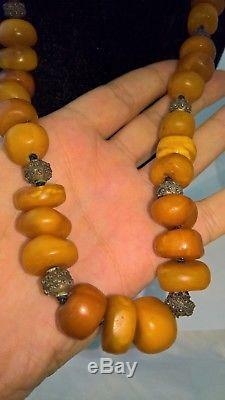 It's a very old and rare piece of antique amber jewelry. Based on its patina it was polished cca. 120-150 years ago from excellent quality genuine Baltic amber. Beautiful, mature beads in the most cherished. Butterscotch and egg yolk colour. I re-threaded the necklace on a flexible band. 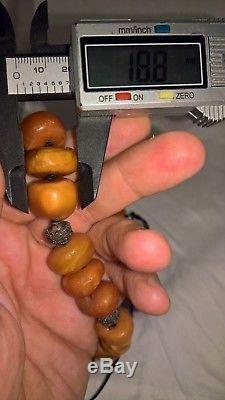 I weighed the amber beads separately from the silver. Beads size: 10-18,8 mm. 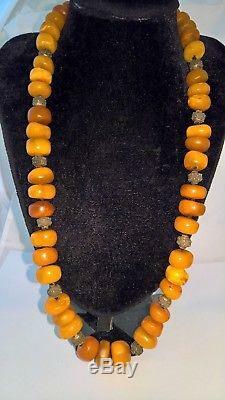 100% genuine old Baltic amber, hand-polished. NOT pressed, NOT molded, NO chemicals. If you have any questions - feel free to ask me. The item "108 grams RARE Tibetan Antique Baltic Amber Necklace Butterscotch Egg Yolk" is in sale since Tuesday, June 5, 2018. This item is in the category "Jewelry & Watches\Loose Diamonds & Gemstones\Loose Gemstones\Amber". The seller is "csokii" and is located in Budapest.